The Thousand Islands-Seaway region has nearly 2,000 islands, sparkling blue waters, and some of the most beautiful scenery in the country. It&apos;s also a giant playground for boating, fishing, swimming, and scuba diving. Add a touch of history, fairy-tale castles, and a wildlife preserve to create your perfect family vacation. Watch living history demonstrations at the site of two major battles of the War of 1812. You can tour the commandant&apos;s house and navy yard, and learn about life aboard historic warships. 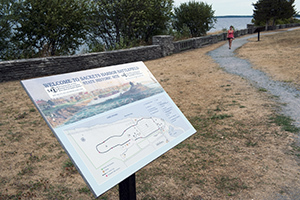 Walk amid the battlegrounds and picnic overlooking scenic Lake Ontario. Take a musical hayride and a trolley tour of the dairy at this 1200-acre working farm in Sackets Harbor. Children of all ages can feed the animals, ride the ponies, play mini-golf, and eat lunch in the Lazy Cow Café. Just a few miles from the village of Sackets Harbor, spend a day (or more) at this popular day-use and camping park. The long, white sand beach is perfect for swimming, and the boat launch sites make it a great spot for canoeing and kayaking, and catching Lake Ontario&apos;s trophy black bass. The park also has a playground, picnic areas, and hiking trails. Campsites on a bluff offer spectacular lake views. At Cape Vincent, this historic lighthouse stands where Lake Ontario and the St. Lawrence River meet. 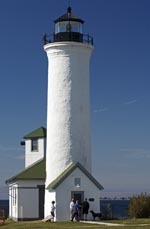 Take a look through the lighthouse telescope to survey the surrounding waterways and islands. You can even spend the night. The Victorian-era lightkeeper&apos;s quarters have been converted to a hostel, with family rooms available by reservation. Explore the Lighthouse Museum at the visitor&apos;s center next door and head into the village to see the Cape Vincent Historical Museum and the Cape Vincent Aquarium. Spend a few hours or a whole day on the St. Lawrence River in Clayton. You can see a collection of more than 100 classic and antique wooden boats, as well as exhibits on river life. Visit the museum docks to board a 106-foot Gilded Age houseboat, rent (and row) a St. Lawrence skiff, or take a 45-minute ride in a triple cockpit runabout speedboat. Events include regattas, children&apos;s activities, and even boat-building classes. On a scenic ecology and habitat cruise, you&apos;ll see native wildlife and learn about the St. Lawrence River&apos;s rich natural history. Watch for waterfowl, shore birds, song birds and raptors, as you meander through the many islands. 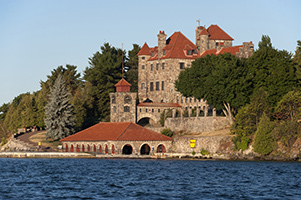 Other tours highlight the area&apos;s state parks, Boldt Castle, shopping and history. In Fineview, explore the 600-acre Minna Anthony Common Nature Center, museum, butterfly house, and shoreline trails. The park also has excellent fishing, a full-service marina, boat launches, and a sandy beach that&apos;s great for swimming. If you want to spend the night, places to stay include tent and trailer sites, cabins, and fully outfitted cottages. Watch spectacular sunsets from the porch. 120-room Rhineland castle on Heart Island in Alexandria Bay. It was built in the early 1900s by George C. Boldt, owner of the Waldorf Astoria Hotel in New York City. Complete with tunnels, a yacht house, Italian gardens, a drawbridge and a dovecote, the grandiose structure was created as a token of love for his wife, Louise. After your tour, you can stroll the gardens and picnic on the grounds. You can reach Dark Island by tour boat, shuttle, or private boat. This sprawling 28-room Scottish-style landmark was built in the early 1900s by the president of the Singer sewing machine company. Tours include the four-story tower and oddities like secret passageways and peepholes. On summer weekends, an afternoon Victorian Tea is available by reservation. If you want the full royal treatment, you can reserve a night in the castle&apos;s suite.